In early 2006, Morgan Babst was wandering around by herself at a Katrina benefit at the Museum of the City of New York, after her brother stood her up, gamely introducing herself to other attendees like Scott Habig, whom she encountered at the bar. Mr. Habig’s family is less antique — his parents met at Tulane — but he still has strong New Orleans credentials: his father, an orthopedic surgeon, was for years the head surgeon of the New Orleans Saints. In 2009, the couple were married at her alma mater, the Academy of the Sacred Heart Chapel. And afterward, their party at Antoine’s became entangled with the St. Joseph’s Day parade, which was lurching its way through the French Quarter. 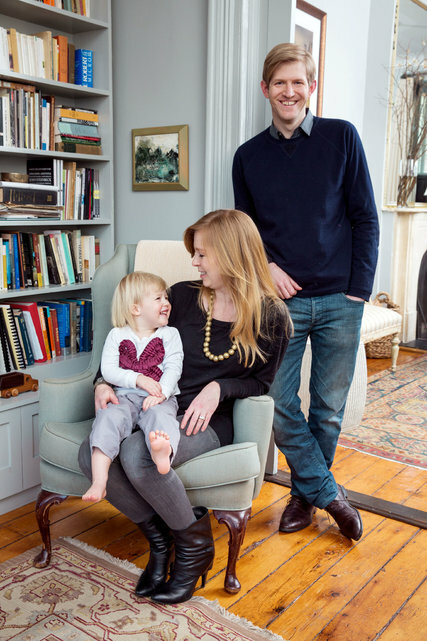 Three years ago, about six months before their daughter, Lise, was born, they bought a brownstone for $1.75 million in Carroll Gardens, a Brooklyn neighborhood strangely peopled with other New Orleans exiles, said Ms. Babst, who is always running into someone she grew up with when she buys the olive salad at Court Street Grocers. The century-old house had belonged to an English professor, said Ms. Babst, who had carefully restored much of it, replacing its fireplaces with period mantels in various materials like limestone, slate and wood. It still needed new wiring, new bathrooms, a new kitchen and paint, all of which cost about $300,000, she said. Thrashing around on the Internet, as she put it, she stumbled onto a blog put up by Suzanne and Lauren McGrath, a mother-daughter design team whose work most resembled what Ms. Babst had in mind. Ms. McGrath senior had worked for Cullman & Kravis and Thierry Despont before becoming the producer, for 10 years, of Martha Stewart’s television show. Lauren McGrath had worked at Teen Vogue. Ms. Babst’s exposition and the McGraths’ response to it yielded often uncanny results. One day, Lauren McGrath showed up with sofa cushions made from a fabric that was weirdly familiar. Ms. Babst couldn’t figure out why, until her mother pointed out it was the same print her grandmother had used to decorate her grandfather’s law offices back in New Orleans. Last month, Ms. Babst sold her first novel, “The Floating World,” to Algonquin Books. Set in New Orleans in the aftermath of Katrina, it centers on a Creole family shattered by the storm. It was a tale nearly a decade in the making. Ms. Babst still has the chipped brown Pottery Barn desk she wrote the novel on. But when her advance check comes, she said, she plans to buy a new one that she saw at McNally Jackson, the independent bookstore on Prince Street. An earlier version of a picture caption in the slide show with this article misspelled the given name of the artist whose work, “Father Holding His Son,” is pictured. It is George Dureau, not Georges.